Recently, Gagan Thapa respect to the Nepali Cricketer and Nepalese with giving congratulation to all, when Nepali Cricketer well played and lead to be the winner to playing ICC twenty-20 world cup in Bangladesh. He posts a message in Facebook and twitter, and welcomed to Nepali Cricket team in the country with a great victory in the field of Cricket. In the meantime, Nepali Cricket team is welcomed by thousands of fans and other former board member of NCA in Tribhuwan International Airport on 1st December, 2013. 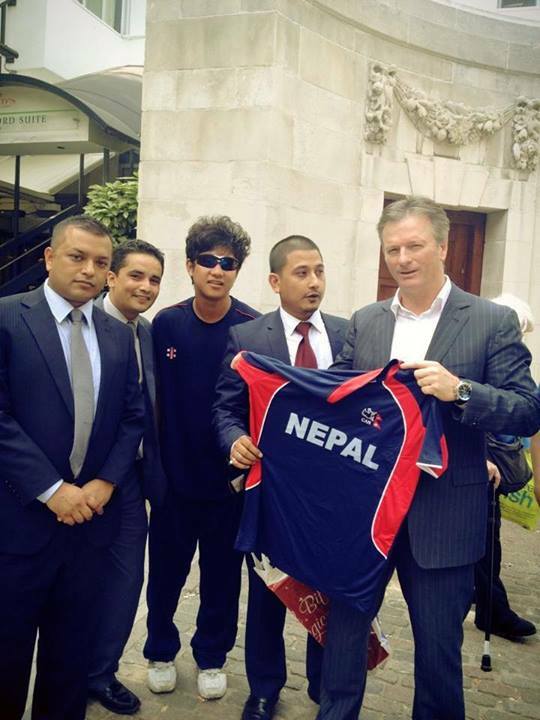 The last July, Gagan Thapa, center committee member of Nepali Congress and former Australian cricket caption Steve Waugh were presented the Nepal Cricket Jersey in London. The message is about the Nepali Cricket and the Nepal to improve and develop in the field of Cricket of Nepal. While those who have been following cricket need no introduction for Steve Waugh. They did not have enough idea about Gagan Thapa in politics and the field of Cricket. At the same time, Gagan Thapa who has a keen interest in Cricket which may lead to enhance the Cricket and Nepali Cricket Team to play with a motivation. Yes, yours truly has been him on the cricket ground in the recent past, when Nepal was playing. The interest of Cricket and Nepali Cricket players activities are growing up day by day. So that, the poor development countries like Nepal has a great opportunity to playing world cup. In the same case, Gagan Thapa asked to the government to improve and enhance the facilities and the other things to which has lead a success in Cricket. Best Luck for Nepali Cricketer and Nepal for ICC twenty-20 World Cup (Bangladesh).